The KELOMAT mini pan shows that the smallest version of the CeraMic COLOR series can also be a big star in cooking. With a 16-cm diameter, this pan is perfect for every single cook. It can also be used for heating up yesterday’s leftovers quickly thanks to its good heat conduction. In addition, it is perfect for quickly browning nuts and spices, or for melting butter. 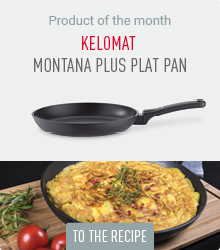 Optically, it is a real gem in every kitchen as well with its yellow KELOMAT COLOR special coating and its cream-coloured ceramic non-stick sealing on the inside – heat-resistant up to 400 °. 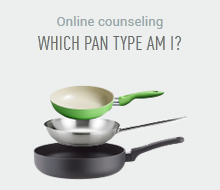 There will be nothing left to wish for functionally as well: the coated pan heats extremely quickly and is ready for use in a heartbeat (you can turn the heat down a bit afterwards). The ceramic coating prevents sticking and enables easy handling. The shaped synthetic handle sits comfortably in your hand and is heat-resistant up to 160°C with flame protection. The ceramic sealing is robust. However, scratching and/or sharp objects should not be used on it. We recommend our KELOMAT synthetic kitchen aids.